It was the simplest of questions from Jay Allen ’79, and the answer carries a great deal of weight. 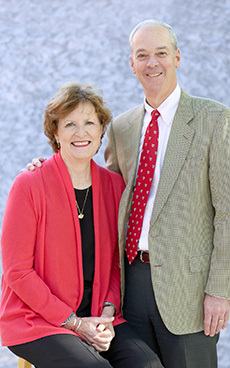 Jay and his wife Susan recently made a $2 million gift to the College's Giant Steps Campaign that celebrates Wabash’s rich tradition of athletics and recreation in the building that bears his family name. The gift will, in part, provide state-of-the art equipment for recreational users and varsity athletes alike, including a completely refurbished fitness center and new weight room, while improving the experience for Wabash students and boosting the College’s recruitment efforts. The generous gift continues a legacy established by his parents, Bob ’57 and Betty H’57, whose $10 million gift in 1998 made the Allen Athletics and Recreation Center possible. Twenty years later, Jay is appreciative that the Allen Center remains essential to the Wabash experience. The Allen Center, and what it represents to the Wabash community, is as essential to Jay now as it was to his father when that keystone donation was made. A self-described good student, Jay finds himself leaning on some of the lessons gained both in and out of the classroom, and the maturity that comes from a little perspective. The economics major and current Managing Director for Bank of America Merrill Lynch freely admits that the idea of making such a large donation isn’t easy. The Allens often ask those simple questions: what’s important or how can we make a difference? That support has paid dividends not only to a generation of Wabash students who prepare as vigorously for the upcoming 125th Monon Bell Classic as they do for a mid-afternoon cardio session, but the faculty and staff who use the facility in a multitude of ways as well.